The 458 Spider is the first car ever to combine a mid-rear engine with a retractable folding hard top that delivers both unprecedented in-cabin comfort when closed and unparalleled Spider performance. A story that changes with the times but which also continues a glorious tradition founded in great part on fabulous open-top cars designed for hot sunny days: Spiders, Cabriolets and Barchettas. All cars that are spectacularly wonderful to drive because having just the open sky above you as you grip the wheel has a unique and truly unforgettable emotional impact: hearing the engine’s soundtrack, feeling the car’s speed, having the perfumes of the world swirl around you. The Ferrari 458 Spider offers a whole new set of emotions and adds a genuine sense of sportiness and power to weekend trips à deux. The hard top’s movement and the way in which its two sections fold away into the compartment in front of the engine have resulted in a highly original division of the volumes. The constraints involved in a retractable folding hard top actually provided the inspiration for forms that neatly resolve the problems of its packaging, both from the point of view of the car’s layout and its aerodynamics. While the bonnet and the flanks didn’t require any modification at all, the rear had to be completely redesigned. 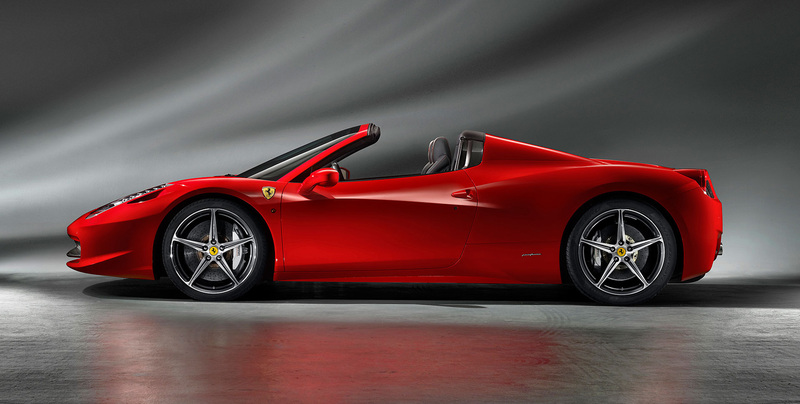 The result is that the 458 Spider is about 12 percent more aerodynamically efficient than the F430 Spider. Its nose features two small aeroelastic winglets which generate downforce at the front of the car and, as speed rises, deform to reduce the section of the radiator inlets and cut drag. There are also two side diffusers on the car’s underbody which are set back from the spoiler, and the trailing edges of the rear wheelarches feature a radius that helps guarantee efficient brake cooling, as is the case on the coupé. Major innovations specific to the Spider include the geometry of the double curvature roof, the buttresses, rear nolder, and the intake grilles on the engine cover. 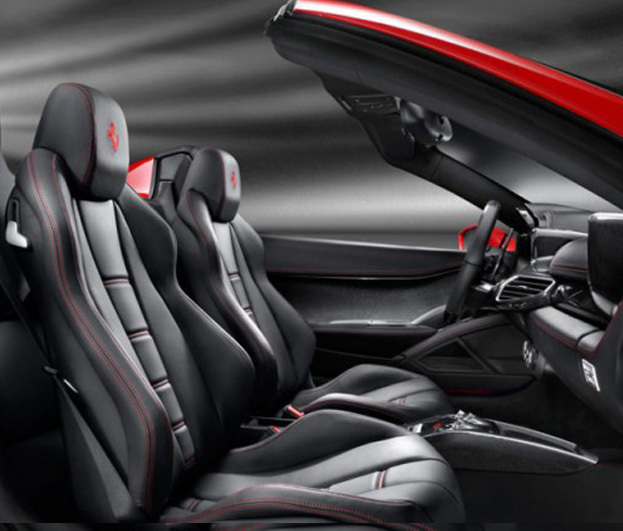 The Ferrari Design has lavished meticulous attention on both space and ergonomics, as well as on finish and trim as befits the car's positioning within the range. The 458 Spider retains the 458 Italia's focus on ensuring the driver feels at the very centre of the car with a Formula 1 cockpit-style driver layout which is designed specifically to minimise the driver's hand movements for complete concentration and focus on the road at all times. The double curvature roof and seating are also ergonomically designed so that even very tall occupants of over 6 ft 4 in. can be easily and comfortably accommodated.